Finding stylish, non-wool winter hats that have little impact on the environment is a tough gig. Thankfully, American Apparel has a new line of recycled cotton/acrylic winter hats! In addition, they are making recycled knit ties. Knitted ties are great for wearing in a casual setting. If you can’t find it at the thrift store, which are typically chock-full of them, this is a great option. And if you want to keep bleach, dioxin, and other toxins away from your boys, don’t forget American Apparel has a great line of organic cotton undies, and tees too! This handsome, organic cotton-twill three button suit from Loden Dager can be found at Opening Ceremony, on sale. 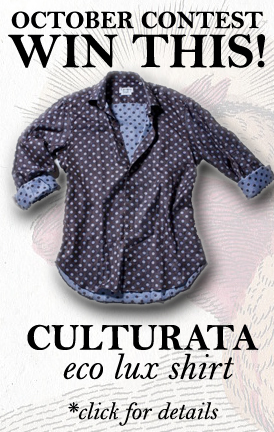 Try it with one of these organic shirts from Sweden’s Velour, and a pair of cruelty-free loafers from Bourgeois Boheme. Matt & Nat never disappoints. The new canvas collection is incredibly handsome, and made from recycled soda bottles, and recycled faux-suede lining. Better yet, you can win one of these bags! Email Matt & Nat at blog@mattandnat.com before August 30th at midnight and tell them what MATT & NAT means to you in 250 words, the best men’s and women’s letters will win one of our new Fall 09 handbags. Steve Alan presents some nice, basic, organic shirts. We love the black and white, single needle check shirt! These tapered organic cotton pants, slouch pants, and shirts from the Australian company, Bassike are not for the faint of heart. But those gents that have a love for cutting-edge trends, check these out! Arn Mercantile offers up an organic Peruvian cotton “chore jacket” and some comfy pullovers. The Japanese company, Kato uses organic cotton from Zimbabwe to make these jackets and shirts. Here are some cool tools to add to your aresnal for the approaching autumn. Whether you’re headed back to school or back to work, new flax kicks, acessories, and organic cotton shirts are a good place to start. Loomstate teams up with Jil Planter for some cool accessories. The UO Linen Oxford combines a flax upper, a faux-leather inner, and a wood and resin sole. Now that’s smart and on sale for $39.99 .The other styles have real cow skin in them, so stick to these beige kicks. Paul Smith has a distinguished autumn organic check shirt. TOPMAN offers up some handsome plimsoles in poly faux-leather brown, and red tartan. These are great for back-to-school and autumn adventures. Nordstrom has a good selection of organic cotton dress shirts for under $30. AUGUST CONTEST: Win a $150 Gift Certificate at the Turk + Taylor online store! Turk + Taylor creatively use organic and sustainable materials and processes to design gorgeous garments for both men and women. Their mastery of reinventing classics and capturing nostalgia makes them one of our favorite lines. All goods are manufactured locally in the San Francisco Bay Area. 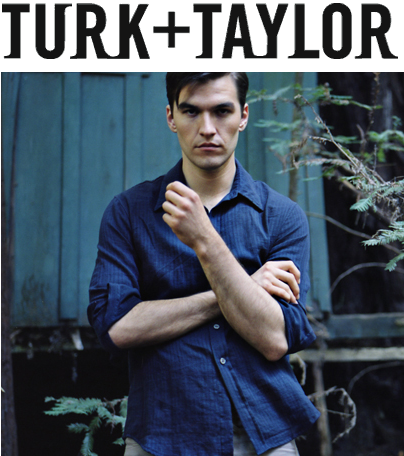 The Turk+Taylor Pop-Up Shop is located at 1529 Fillmore Street in San Francisco. Their phone number is 415-336-5364. They’re open Thursday through Sunday, Noon – 7pm through the end of August. Cities need trees! Friends of the Urban Forest http://www.fuf.net is one of Turk + Taylor’s favorite organizations! Check out their website and then send us anything that inspires you about greening our urban spaces! A letter about what you do, a photo of your rooftop garden, a poem about a tree on your block, a video. Anything goes as long as it’s about the urban forest. Don’t forget to send along an explanation if it’s a visual. The best, most moving and creative submission wins! The winner will be announced SEPTEMBER 1st. We thank him so much for the work he does on behalf of animals. 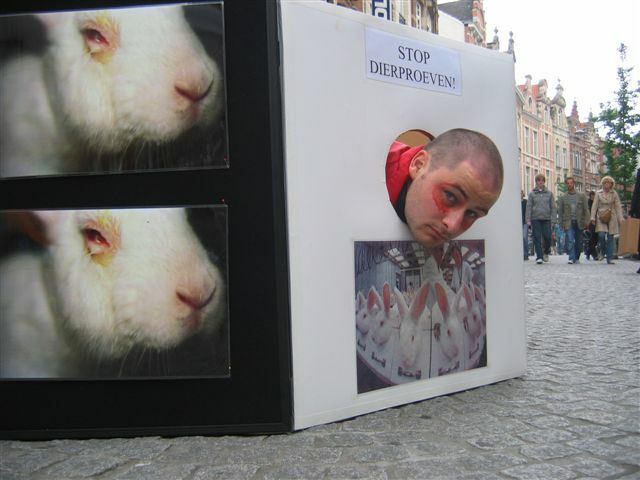 The picture he submitted (above) shows how he raises awareness about painful and outdated experiments that companies like Proctor & Gamble continue to conduct on animals like rabbits. Enjoy the organic cotton, French terry cardigan from COVET , worth $110 USD. 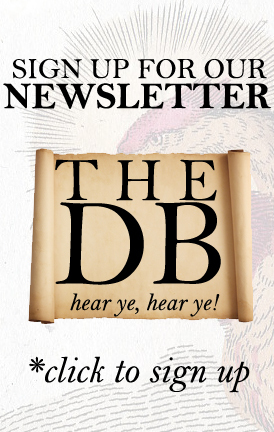 And thank you to all of our readers who entered for all of the amazing work you do! We are truly inspired. Win this $110 COVET organic cotton, french terry cardigan! 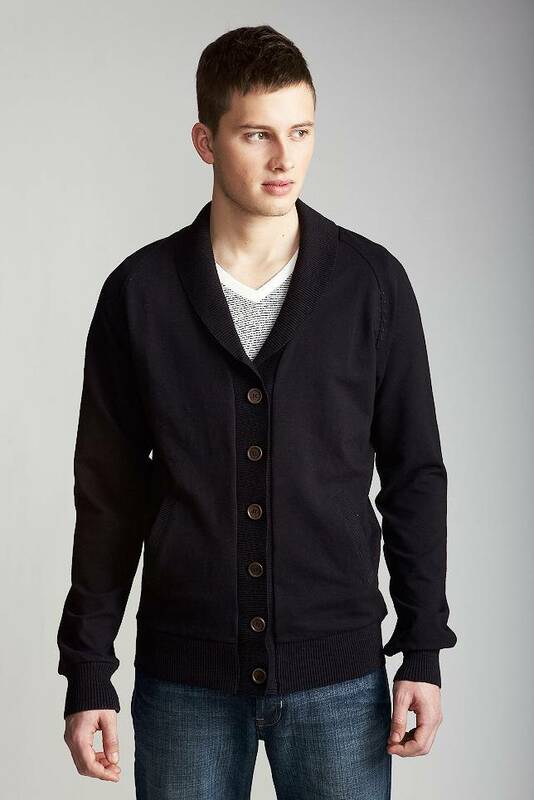 Straight from COVET‘s fall 2009 menswear collection, this organic french terry cardigan is warm, soft, and luxurious. Tara St. James of COVET has been creating superb, handcrafted, organic garments for both men and women for years. 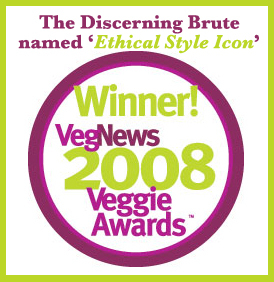 Take a photograph of yourself that demonstrates how you speak up on behalf of animals, people, or the environment! The best, most moving and creative photo wins! The winner will be announced August 1st.